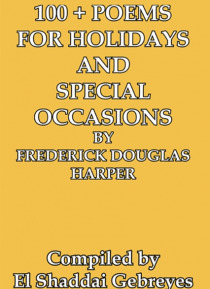 100 + Poems for Holidays and Special Occasions by Frederick Douglas Harper celebrates some of the most significant moments in our lives, like weddings and graduations. This anthology of poetry can and should be shared with the people who matter most to us our family, our friends, and our loved ones. The poems in this anthology serve as inspiration for people searching for the perfect poem to ho… nor a special occasion. Through this anthology, poetry aficionados will also realize the power and potential of words to convey meaning at times when we are most speechless. The vast range of special occasions covered in this book ensures that it will appeal to diverse audiences and a wide range of ages. Within these pages, you will also find Harpers prose on spirituality with forgiveness, because healing is a process involved in most relationships and Harper provides a comforting voice that inspires intense introspection. This book is the ideal companion for someone who wants to experience a true love affair with words.